VIEW "ALL" of our Quick Delivery homes! We will "BUILD" on your lot / land! Custom Homes Building is building dream homes in beautiful neighborhoods located in Northeast Florida locations such as: Green Cove Springs, Jacksonville (Mandarin and North side), St. Augustine. 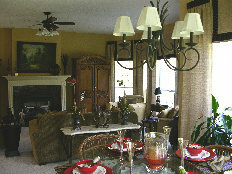 We also build on home owner's individual home sites. If your looking for an immediate move in we can help you locate a NEW HOME ready to move into RIGHT NOW!